The most common cloud service is file storage. A branch of folders and files on your PC’s mass storage system are duplicated on the Internet, available on the web or from any other Internet-connected gizmo. Install the cloud storage software on your computer. This is the program that synchronizes your files from the PC’s mass storage system to the Internet. The account provides the Internet access, not only to coordinate the files but also to a website where you can access your files online. You copy files to the folders on your PC, which are echoed to the Internet and synchronized across any device that also uses that cloud storage. Three popular online storage services are Microsoft’s OneDrive, Google’s Google Drive, and Dropbox. Here is a list of these services and their web addresses. Visit the address to download the software. To add the cloud storage to your PC, follow the general steps. Visit the web page to install the software, create an account, and then start using the service. One drawback to cloud storage is limited storage capacity. That can be addressed if you’re willing to pay for more storage. More cloud storage options exist than the three you find here. Some are open to anyone, but many are paid subscription only — for example, Adobe’s Creative Cloud. Microsoft’s cloud storage service was originally called SkyDrive. Then they found out someone else owned the name SkyDrive, so Microsoft changed it. Open those folders and you often find additional folders, such as Documents, Pictures, Music, and so on. You may find documentation on how to use some of the folders. Press Win + E to summon a File Explorer window. Choose Documents from the left side of the window. What you see is actually a library, not the specific documents folder for your account. That’s okay; the same files are available. Click to select a file, and then press Ctrl + X to move (cut) the file. From the left side of the window, choose OneDrive. It should appear in the Quick Access list. In fact, you may also see Dropbox and Google Drive in that list as well. Double-click on the Documents folder to open it. Technically, you’re now looking at the contents of the OneDriveDocuments folder. Press Ctrl + V to paste the file. After the file is copied, it’s immediately synchronized with cloud storage on the Internet. After a few information superhighway moments, that file is available via the web or on any other device that has access to cloud storage. These steps demonstrate copying a file to cloud storage, but you can also copy a file from cloud storage, move files, rename them, add folders, and so on. When you delete a file from cloud storage, it’s removed from all cloud storage devices. You can move files between devices by copying them to cloud storage. Both Google Drive and Dropbox folders are accessible through teensy-weensy icons in the taskbar’s notifications area. You can still use your PC’s cloud storage folders while the Internet is offline. Any files you add or modify in the cloud storage folders are instantly synchronized after the connection is resumed. Windows uses the backslash character, , to separate folder names when specifying a path. The term path describes the folder hierarchy, listing all parent folders for a specific folder or just the relevant parent folders. The most common way to access your cloud storage is from any web browser; navigate to the cloud storage website and log in, and there are your files. OneDrive even lets you preview and examine files online; you can edit Microsoft Office documents if you subscribe to the Office 365 service. On other devices, you must obtain the cloud storage app. For example, on Android phones and tablets, visit the Google Play Store to obtain apps for Dropbox and OneDrive; Google Drive is included on all Android devices (the app is named Drive). 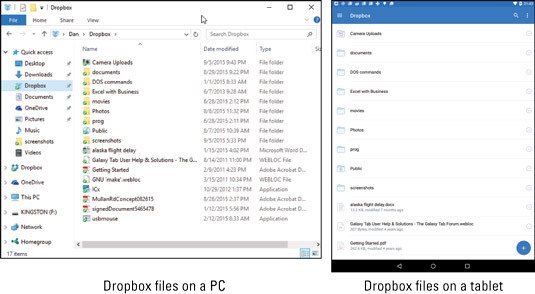 You see the Dropbox folder on a PC right next to how that folder looks when accessed on an Android tablet. To do so, you open the Dropbox app. Files and folders are identical — and synchronized — between both devices. Dropbox on a PC and a tablet. For a laptop or another PC, add the cloud storage software as you did for your first PC. On Windows 10, the OneDrive connection is made automatically, so there’s nothing more to set up.